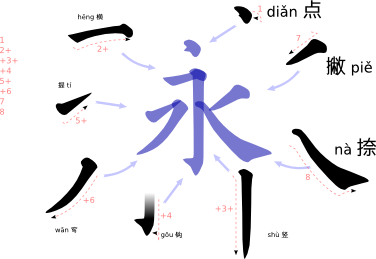 Traditional Chinese — also called “Regular Chinese” or “kǎishū”, appeared around 200 BC. There were numerous evolutionary stages between Small Seal and Traditional Chinese, including a looser, more calligraphic style called “Clerical Script”. At this stage, some of the stylistic conventions appeared that still exist today: thickness at the end of a stroke, and thickening of strokes that go down. This was further refined in the Song and Ming dynasties (960 through 1644, with an interruption for the Mongols), when wood-block printing was popular. It is easier to carve straight lines parallel to the grain than perpendicular to the grain, and thin cuts against the grain would break. This led the carvers to make the characters with thin horizontal lines and thick vertical lines. Just as the shape of cuneiform glyphs was influenced by the writing technology, so was Chinese. Writing material affecting glyph shape is something you will see over and over again as I go through more writing systems. This, coupled with Chinese’s open-ended character set, means that it is possible to make up nonsense characters that look plausible. An artist named Xu Bing did just that, with a massive work that followed conventions for artistic scrolls, but which had nonsense glyphs on it. Apparently this was profoundly disturbing to many Chinese people. To be able to read was an important part of their self-identity as an educated person. Being able to read standard written Chinese has — for hundreds of years — been a unifying element of Chinese culture with its many spoken languages, so reading Chinese was also an important part of those Chinese people’s cultural identity. This entry was posted in Evolved slowly from parent, Logograms, Rating: 5 "Whoa!! ", technology influenced. Bookmark the permalink. I always wonder whether Chinese fantasy writers ever invent characters. I’m also curious about the redundancies that must exist, given that non-young eyes do read Chinese in small type.